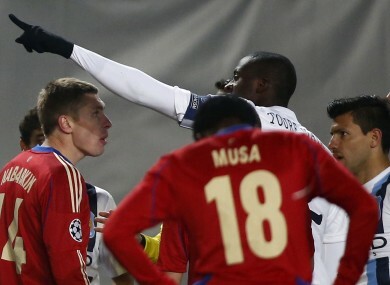 Yaya Toure, centre, pointing towards fans speaks to the referee Ovidiu Hategan, unseen, CSKA's Kirill Nababkin, left, and Musa, back to camera, during the Champions League group D match between CSKA Moscow and Manchester City. IT’S BEEN SAID before and the point will probably be made countless times in the future again — it’s time for Uefa to practice what they preach. In recent years, instances of monkey chanting and other racist insults emanating from sections of various clubs’ fans have resulted, at worst, in a limp fining of the team in question or a barring of their fans from a few future games. And yet, in spite of these actions, racism remains a problem among certain European football teams. Hence, clearly these measures are not working thus far. The most recent high-profile racism case occurred during Manchester City’s Champions League trip to CSKA Moscow earlier this month. During the game, City midfielder Yaya Toure was the recipient of monkey chants from a section of the home fans. While such behaviour was sadly not exactly surprising given Russia’s recent history of racism at football grounds, the club’s reaction was, by contrast, astonishing. In addition, quotes from CSKA forward and Ivory Coast team-mate of Toure, Seydou Doumbia, appeared to have been partially manipulated in a further attempt to discredit the 30-year-old midfielder. This defensive attitude towards blatant cases of racism is depressingly not uncommon, it seems. Rather than taking responsibility and doing their utmost to eradicate this unfortunate reputation, many of the CSKA authorities have pleaded ignorance and some even regard such claims as part of a conspiracy or unwarranted attempt at blackening the country’s name by a Western society intent on causing them harm for no good reason. The latest allegation from a leading CSKA official is that they are simply innocent victims of a British ‘smear’ campaign. Therefore, a combination of Uefa’s lax punishments and many of their authorities’ ostensible indifference to the issue means its continuing prevalence in Russia is hardly a surprise. The point has also somewhat justifiably been made about the hypocrisy with which the situation is being viewed in Britain — a country that itself has invariably had problems in various guises with fans’ behaviour — the sickening chants that United and Liverpool supporters have been known to sing at each other are one case of many that are equally serious and no less contemporary. Even Ireland fans are not averse to disreputable conduct — the sectarian booing of Rangers players from the not-too-distant past is a prime example. Yet at least in both the latter cases, some progress has been made to the extent that the issues are nowhere near as large scale as they once were, whereas in Russia, the improvement is considerably less stark and conceivably non-existent. Moreover, Uefa yesterday announced that part of CSKA’s stadium would be closed off for one game as punishment for the incidents in the City match. With such flimsy actions, the organisation’s insistence that strict measures should be taken to tackle racism is starting to ring hollow. As Stan Collymore rightly pointed out on Twitter yesterday, there’s nothing to stop those guilty of racism simply buying tickets for another area of the ground and attending the match without reprimand. And even if they elected to close off the stadium entirely, it is doubtful that either the guilty fans or the club (judging by their behaviour so far, at least) would take such an action especially seriously. So what could have been done to make a genuine difference? Docking CSKA the three points they earned against Viktoria Plzen and awarding them to their opponents would surely have had a greater effect. Such an action would cause serious damage to the club’s European campaign, thereby potentially impacting on their finances (far more so than the standard fine anyway) and so, it would perhaps make them think twice before essentially defending racist fans again. This measure would also serve as a potent warning signal to all other clubs whose fans have been guilty of racism in recent years to do more to combat the problem — handing out lifetime stadium bans to those proven to be guilty of racism would be a good start. Granted, it could be argued that the club themselves don’t deserve to be punished for the behaviour of a section of its fans, yet by failing to condemn them in the immediate aftermath of the game, they were virtually endorsing such actions to a degree. The reprimand may seem severe, but harsh penalties are needed to stem the serious damage that racist behaviour is constantly causing the game. However, if Uefa continue to dither and implement meaningless, token penalties, a perpetual sense of déjà vu could become irrevocably associated with such predicaments and consequently, the World Cup in 2018 will potentially turn into the organisation’s greatest fiasco yet. Email “If Uefa are serious about fighting racism, they need to start docking points off guilty clubs”. Feedback on “If Uefa are serious about fighting racism, they need to start docking points off guilty clubs”.